If the mere thought of having a Halloween party for a bunch of children is enough to make you turn into a witch, relax. Party hosting doesn’t have to be stressful. 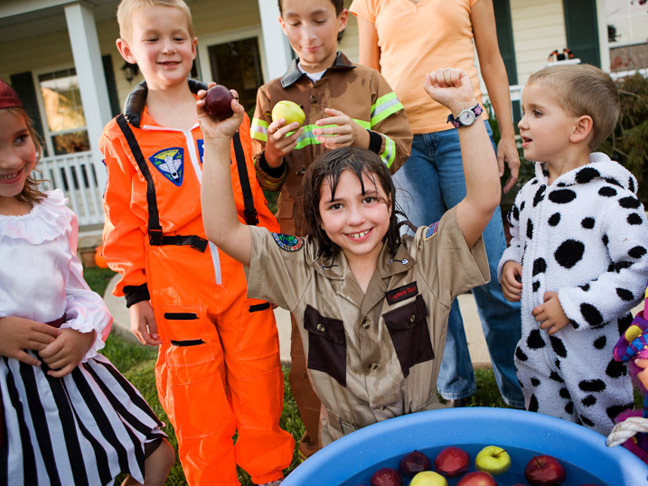 In fact, with a little planning and preparing, hosting a Halloween party for a few of your children’s closest friends can be quite fun, especially if you follow these tips. Whenever I throw a Halloween party for kids, I always print out a schedule and hang it up in a visible place (I’ve even been known to include a copy with the invitation). With a large group of young children, things can get chaotic quickly, so having a schedule allows everyone to know what to expect and helps to keep everyone on the same page. When scheduling your Halloween party, be sure to plan it around nap times, if your guests are of the napping ages. Early morning parties that start at 10 AM or later afternoon parties that start at 3 PM usually work best. When planning Halloween party activities take into consideration the ages of your guests. Putting a Halloween twist on familiar, age appropriate games often makes for the best activities. Hide plastic pumpkins in the back yard and play “Hide the Pumpkins” or instead of “Duck, Duck, Goose” play “Pumpkin, Pumpkin, Jack-o-lantern.” Reading Halloween themed stories and singing Halloween themed songs are always a hit with younger children. Well fed children are well behaved children. Be sure to offer your guests a few Halloween themed snacks. Press a sliced almond into the end of a cheese stick or breadstick to create a withes finger, serve orange colored cream cheese on whole wheat bread, or dip the ends of pretzel rods into melted chocolate and roll it in colored sprinkles to look like a sparkly wand. If you’re hosting your party around a meal time, be sure to offer a meal to your guests or indicate on your invitation what will be served. Pizza is always an easy party option. If you are concerned about allergies, consider adding a line to your invitation asking guests who have allergies to contact you prior to the party. Having a Halloween themed craft or Halloween themed coloring pages and crayons available can provide for a quiet activity when a break is needed. Some children are overwhelmed in a party atmosphere and having an area where they can take a break and do a quiet activity can be helpful. Whether your party will be inside or out, be sure to childproof your party area. Move any breakables out of reach and gate off areas of the home that you want to prevent access to. If your party is outdoors, be sure that all landscaping items and chemicals are put away and be sure the play area is safe and secure. When you consider the ages of your guests and plan around their developmental needs and levels, you can truly plan a wonderful, stress free Halloween party that the children and the adults will enjoy.